Welcome to the JazzCast, a new podcast devoted to the appreciation and listening of the great genre labeled as jazz. Usually, I’m going to be doing interviews, but for the first episode, I’d like to lay out my vision of this show. Basically, this podcast idea was born as I was driving to work and wanted to hear new jazz but was unable to find a radio station out where I live. My hope is to give this genre a positive push, to focus on the music and the tremendous talent pool behind the genre.Welcome to the JazzCast, a new podcast devoted to the appreciation and listening of the great genre labeled as jazz. My goal is interview new jazz musicians and to post their original music on the podcast app in iTunes and Stitcher radio. I’d like to start out with local musicians in the DC area, and then branch out across the US and the world. If you or anyone you know has original music and would like to be interviewed, please let me know. You can contact me at jazztothebone [@] gmail.com. Before we get started, I would love for you to visit my website, http://jazztothebone.com . You’re welcome to subscribe to my email list to know each new artist as I post the podcasts each week. With that said, I’d like to give you a little of bit of information about myself. 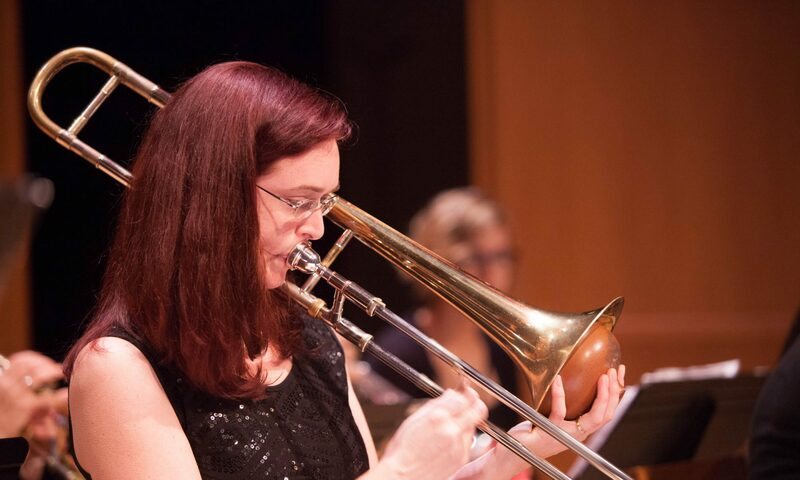 I’m a high school music technology and finance teacher, as well as an active trombone in the DC area. I play every Monday night with the Bohemian Caverns Jazz Orchestra, and you’ll hear me talk about that a lot because a lot of the musicians I know are from that particular ensemble. I also run my own all-female big band called Shannon Gunn and the Bullettes. We’re made up of professional musicians from the DC area. You can find out more at bullettesjazz.com. I also play in several pick up combos, do a jazz combo of my own on the side called Jazz to the Bone, and I play in a salsa band called Timba Street. I’m really looking forward to bringing new talent into this podcast and getting to know some musicians in this area. If you’d like, you can follow me on twitter. Everything is jazz to the bone. So I’m on twitter at jazztothebone, facebook at jazztothebone2, Instagram at jazztothebone, and I even have a very low active g plus at jazztothebone as well. Once again, thank you so much for joining me today. I hope to see you back again for the very first interview, episode 2, of the JazzCast. Many thanks to Brent Birkhead for letting me use his song “Ivory Antidote” as the bumper music. This is a recording I made of him playing with Karine Chapdelaine on bass, Josh Walker on guitar, and CV Dashiell the 3rd on drums at Caton Castle restaurant in Baltimore. You can hear more of his music at http://brentbirkheadjazz.com. I hope to get everyone in this recording on here some day. New project to launch November 25! Hi everyone! I’m super excited to be working on a new secret project that I will be releasing on November 25th. I hope you all will join me and check out this site on that date. T’will be fun!